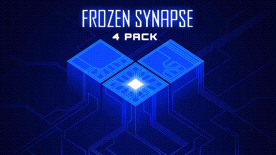 Includes four copies of Frozen Synapse - Send the extra copies to your friends! Frozen Synapse is the ultimate tactical game bringing the simultaneous turn-based strategy genre bang up-to-date and lets you give detailed, accurate orders to your squad: classic gameplay with a modern interface. Plan your moves, test them out, then hit the "Prime" button: both you and your enemy's turns are executed simultaneously. Competitive-but-intuitive multiplayer and a huge single player campaign mean that Frozen Synapse will give you hours and hours of tactical delight.